Are you stuck in a rut? Do you have writer’s block? Need a quick plot idea for that short story writing assignment that’s due tomorrow? Lists for Writers is here to help! What is it? Lists for Writers is exactly that – lists for writers. We’ve compiled a variety of lists to help writers, both young and old, come up with brainstorming ideas. Lists for Writers is a great addition to any writer’s toolbox. Helpful to both novice and expert writers alike, this app delivers list after list of prompts and ideas for your brainstorming sessions: names, character traits, plot lines, occupations, obsessions, action verbs, and much more! Whether you are working on a creative writing project, a short story, an essay assignment, National Novel Writing Month / NaNoWriMo, or your next fiction book, this app helps get it done. It is available now in the iTunes App Store and is a universal app that works for iPhone, iPad, and iPod Touch. It is also available for Android in the Google Play Android market, for Android and Kindle Fire in the Amazon Appstore for Android, for NOOK in the NOOK store, for Windows Phone in the Windows Phone Store, and for BlackBerry 10 in BlackBerry World. ★ Slate Magazine: Writing apps can make you more productive. Can they make you more creative? On yet another oppressively humid afternoon in south Florida, Caitlyn Cartwright relaxed in the hotel pool and contemplated her current situation. One month ago, her great aunt Melody summoned her all the way from England to help get her estate in order and learn about her future responsibilities. This came as a shock to poor Caitlyn , as she hadn’t any idea she even had an aunt in Florida! Why her? Didn’t this Melody woman have any other relatives? Apparently not. She’d been keeping tabs on Caitlyn from her auspicious birth and knew that she was the one who had been promised to carry on the family gift of clairvoyance. Melody had visions of her successor in countless dreams preceding Caitlyn’s birth. Now, this is not great literature, but it’s more writing than I had 15 minutes ago. It got me thinking about the passing of gifts through a family or lineage. I also thought about clairvoyance and how that could add a number of twists into another story of mine that remains incomplete because of writer’s block. Lists for Writers is a great addition to your writing toolbox. Helpful to both novice and expert writers alike, this app delivers list after list for your brainstorming sessions. Let’s get those creative juices flowing! We are always looking for ways to improve our products and we value your input. If you have a problem with our app or a recommendation, please let us know about it. Check out our Support page. If you have found our app helpful, or have used it in your writing, please share your good fortune with others. To return the favor, we’d love for you to share a link to your writing, author’s page, or livejournal account, to let us know about your writing projects. Thank you! 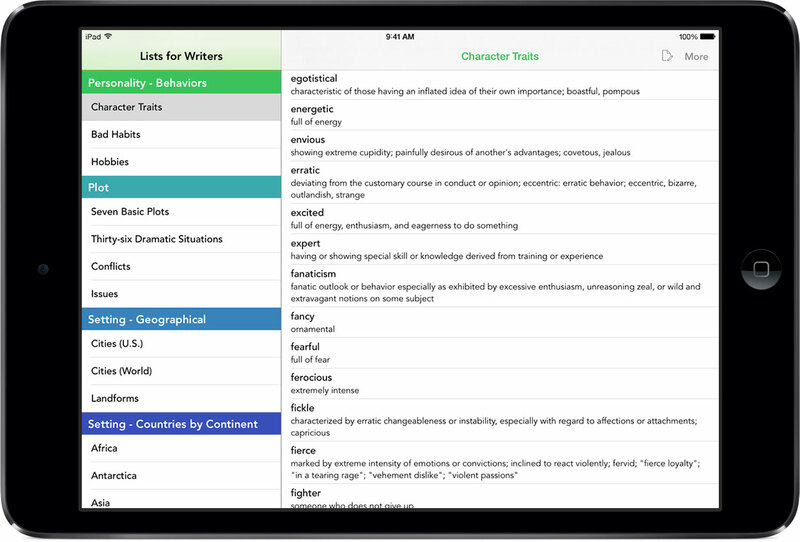 Lists for Writers for Apple iPhone, iPad, and iPod Touch – available from the App Store. Lists for Writers for Kindle Fire and other Android devices – available on the Amazon Appstore for Android. Lists for Writers for Android devices – available from Google Play. Lists for Writers for NOOK – available from the NOOK Store. Lists for Writers for Windows Phone 7 and 8 – available from the Windows Phone Store. Lists for Writers for BlackBerry Z10, Q10, and PlayBook – available from BlackBerry World.